Thalappakatti biryani is one of the famous biryanis of Tamil Nadu. It is originated in Dindigul district (near to Madurai).Thalappakattu mean 'turban' a type of head dress. The founder of this biryani wears turban on his head hence this biryani called 'Thalappakatti biryani. This biryani is prepared using a small flavorful variety of rice called Jeeraga samba. 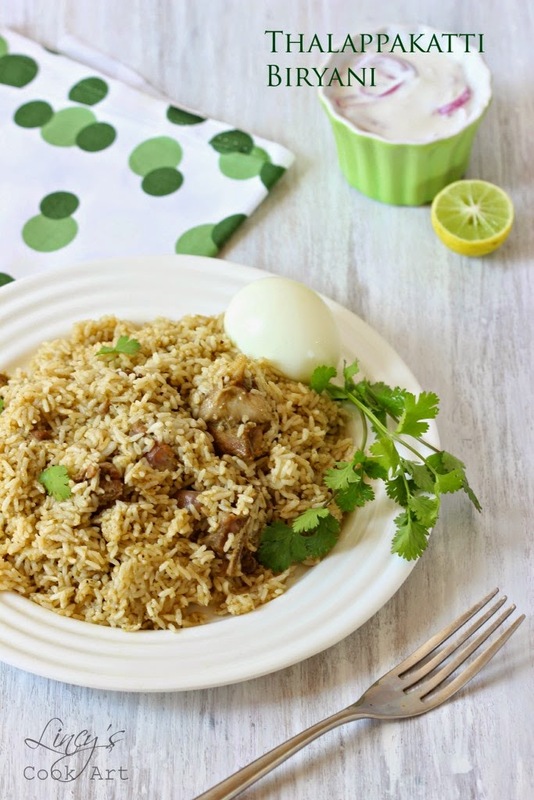 This is an easy to make flavourful biryani with limited ingredients. This biryani looks light green colour because of the freshly prepared flavourful masala paste. This biryani is prepared at shops by keeping in dum. But im here using pressure cooker, to make this biryani to maee it simple and easy. 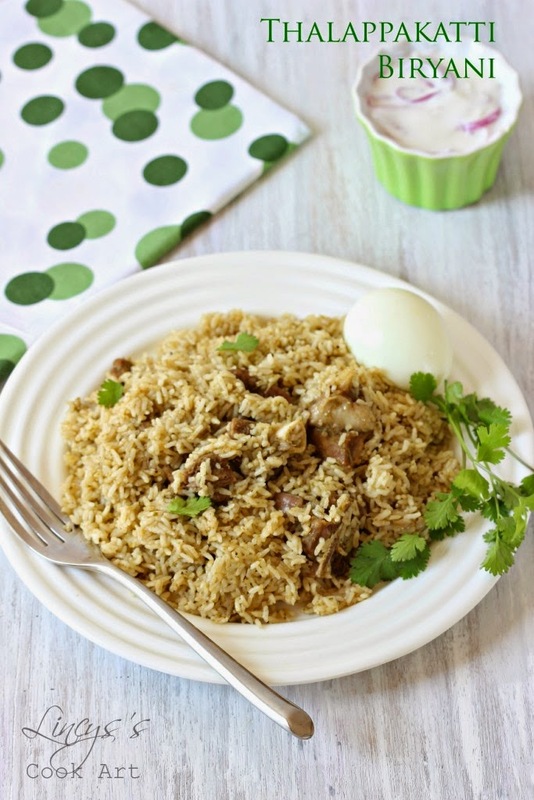 We loved this flavourful biryani, so do try this at your home and let me know the outcome. I got this recipe from recipe collection aval vikadan booklet and modified slightly according to the origional biryani i have tasted last year. Wash and soak the rice for 30 minutes; that is just before starting to prepare the biryani. In a blender jar add the ginger, garlic, green chillies, coriander leaves, mint leaves, cinnamon, clove, cardamaom, nutmeg and mace. Pulse to slightly powder all the ingredients and add very little water and grind to make as a paste. Scrape the sides of the jar using a spoon in between for uniform grinding. Heat oil with a tablespoon of ghee in a pressure cooker add the chopped or slightly minced onion and cook till the edges of the onion starts to become golden. Now add the ground masala paste and roast in that oil till the raw smell leaves and the oil starts to separate. Add litttle more oil if you feel it starts to stick at the bottom. Now add the mutton/chicken with some salt and cook till the colour of the mutton/chicken starts to change from pink to white. Add the chilli powder and curd and mix well. Add a cup of water and mix well with a ladle and check for salt. Close with a lid and pressure cook the mutton for about 4 whistles (or) chicken for a whistle. Mix twice with a ladle and check for salt. Close with a lid and pressure cook for two whistles on medium flame and then reduce the flame to sim or transfer the pressure cooker immediately to low flame burner and for 2 minutes like dum to evaporate any excess water. After 2 minutes switch off the flame and allow the pressure to go off by itself. Open the lid once the pressure releases and transfer the biryani on to a big vesssel to stop the cooking process. Serve hot with raita and boiled egg. Notes: To cook 2 ½ cups rice requires 33/4 cups of liquid. Already yogurt and water added to cook the mutton, that is 'quantity of the gravy' approximately 1¼ cups there. So i have added 2 ½ cups of water to cook the rice.